No guarantee that I’ve done it correctly, but the motor spins clockwise/anticlockwise. There are some nice diagrams of the stepping process here. //  Demo function:The application method to drive the stepper motor. 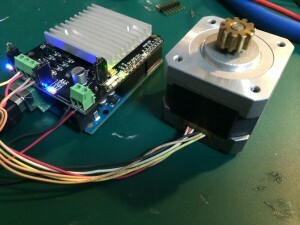 initialize();//Initialization for the stepper motor. step(200);//Stepper motors rotate anticlockwise 200 steps. step(-200);//Stepper motors rotate clockwise 200 steps.